The development of clinical computing systems is a rapidly growing priority area of health information technology, spurred in large measure by robust funding at the federal and state levels. It is widely recognized as one of the key components for reducing costs and improving the quality of care. At the same time as more and more hospitals and clinics are installing clinical computing systems, major issues related to design, operations, and infrastructure remain to be resolved. This book tackles these critical topics, including system selection, configuration, installation, user support, interface engines, and long-term operation. It also familiarizes the reader with regulatory requirements, budgetary issues, and other aspects of this new electronic age of healthcare delivery. 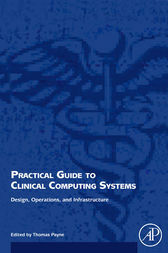 It begins with an introduction to clinical computing and definition of key terminology. The next several chapters talk about system architecture and interface design, followed by detailed discussion of all aspects of operations. Attention is then given to the realities of leadership, planning, oversight, budgeting, and employee recruitment. This invaluable resource includes a special section that talks about career development for students and others interested in entering the field.